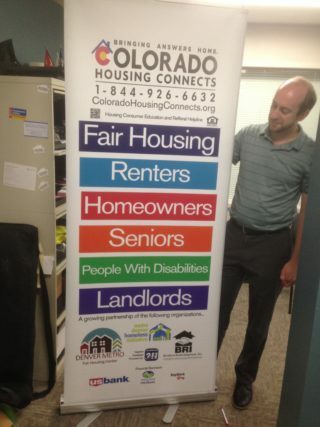 The Colorado Housing Connects phone line specializes in helping people navigate non-emergency housing services and resources. Our free bilingual helpline provides information about a wide range of housing services and topics of interest to renters, landlords, first-time homebuyers, seniors, persons with disabilities and anyone with fair housing concerns. I am a renter…for now! How can I become a home owner? Can you help me understand tenant-landlord laws and rights in Colorado? Im facing eviction and need advice. I think my landlord or property manager treated me unfairly. I don’t know what to do. Where do I find affordable rental housing? Im not a homeowner – yet. Where should I begin? I’m thinking about refinancing and could really use some information. I’ve fallen behind on my mortgage payment. What are my options? I’m getting older and have equity in my home. What about a reverse mortgage? I would like some information about housing in the Denver area. My home needs repairs. Can you help me? I’m getting older and would like to continue living in my home. How can I tell if I’m being discriminated against because of my age or disability? I am interested in renting to someone with a Section 8 voucher or other subsidy. Can you advise? How would I connect with a potential tenant transitioning out of medical rehabilitation or assisted living? I am interested in making a unit available to a veteran. How do I proceed? Colorado Housing Connects is your statewide housing helpline! Brothers Redevelopment is teaming with the City and County of Denver to provide temporary rental and utility assistance (TRUA) to eligible residents. The TRUA program assists Denver residents who are facing a housing crisis or hardship because of circumstances beyond their control. The financial assistance aims to prevent displacement or eviction. The grant also can help residents stabilize their housing situation or gain time to find alternative housing. Residents who are facing disconnected services may receive money to make utility payments. The program is temporary assistance for residents facing a crisis they can document or demonstrate. TRUA pays a portion of the amount needed to bring residents current with their required payments. Call the city’s 311 helpline and press 6. City staff will ask a few quick questions, such as your ZIP code, before directing you to Brothers or another nonprofit that administers the program. Or visit www.denvergov.org/LEAP for more information about LEAP (Low-income Energy Assistance Program). Applicants must complete the application form and send it back as directed. Applications will not be processed until completed with all required information and documentation. A housing counselor or navigator will contact you regarding the status of your application. If approved for rental/utility assistance, payment will be made directly to the landlord or utility provider within 48 working hours.